Fall-Like Weather & Much Colder This Weekend Into The First Of Next Week. Cumulonimbus Mammatus (CBMAM) Clouds Streaming Eastward From A Severe Thunderstorm Located Near Dell City, Texas, Or Just South Of Guadalupe Peak. 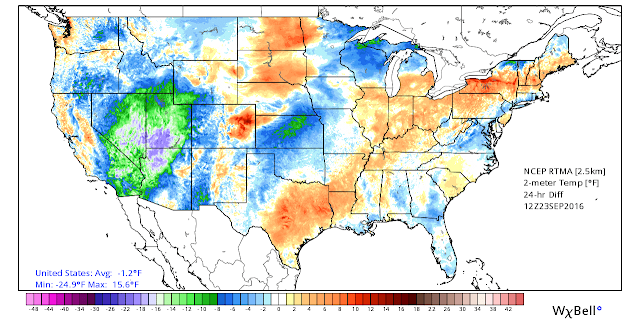 Much Cooler Out West This Morning. 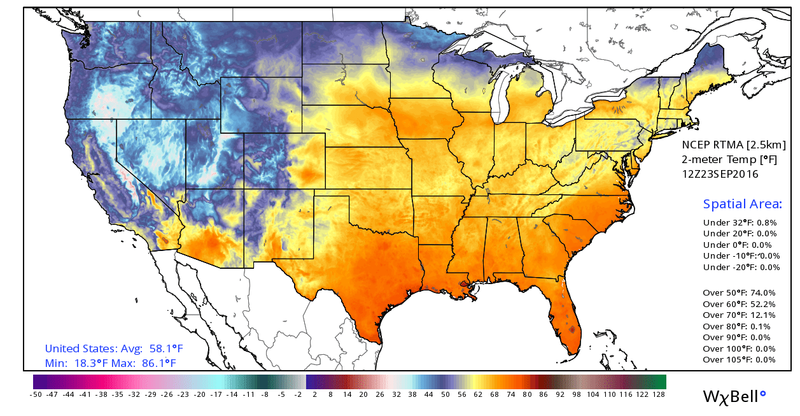 Temperatures & 24-Hour Differences At 6 AM MDT This Morning. Major Changes Coming In With Our Weather This Weekend. Last Nights 06Z/Midnight MDT GFS 500 MB Analysis. Last Nights 06Z/Midnight MDT GFS 500 MB Forecast. 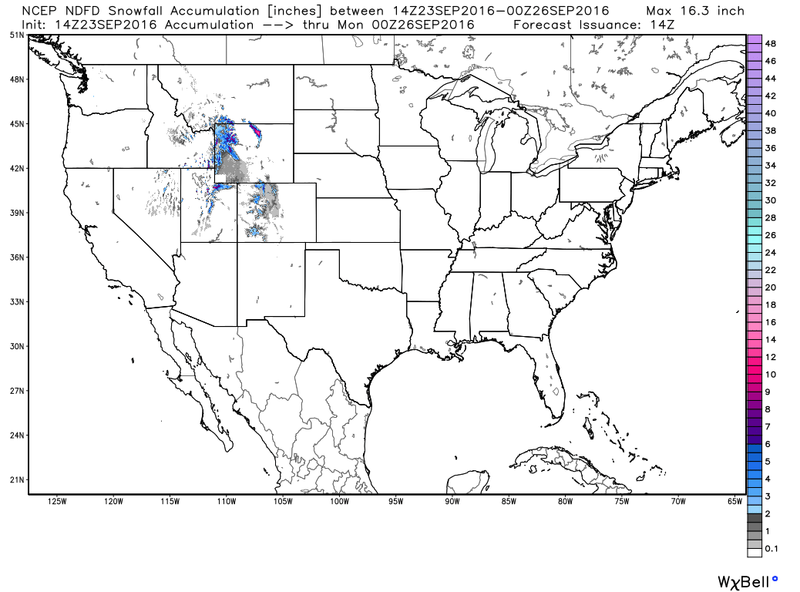 Valid @ 6 PM MDT Monday, September 26, 2016. Last Nights 06Z/Midnight MDT GFS High Temperature Forecast. 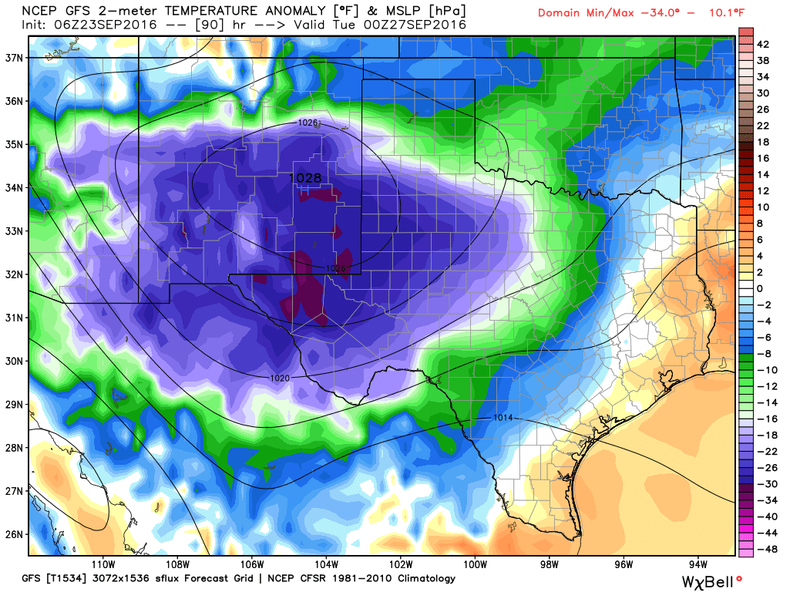 Last Nights 06Z/Midnight MDT GFS Temperature Anomaly Forecast. 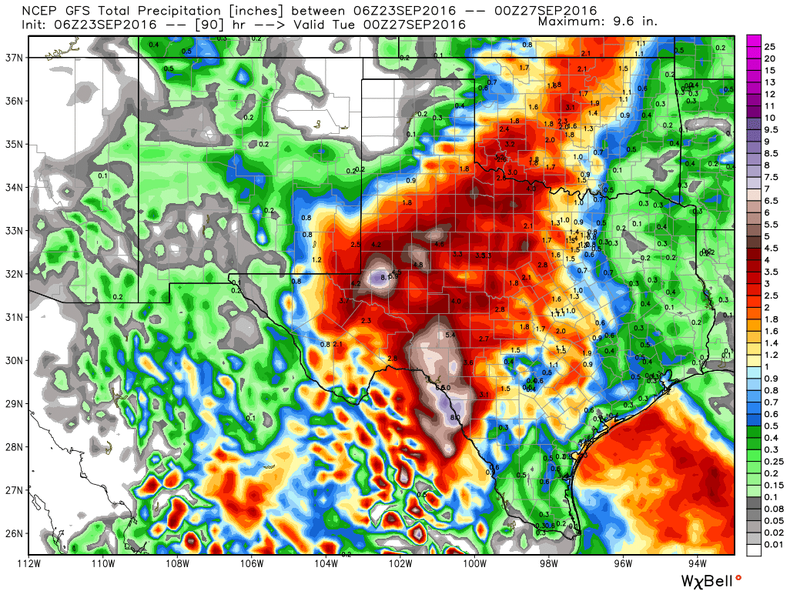 Last Nights 06Z/Midnight MDT GFS Storm Total Rainfall Forecast. NWS NDFD Snowfall Accumulation Forecast. Valid @ 6 PM MDT Sunday, September 25, 2016. Take a look at the temperature maps above. 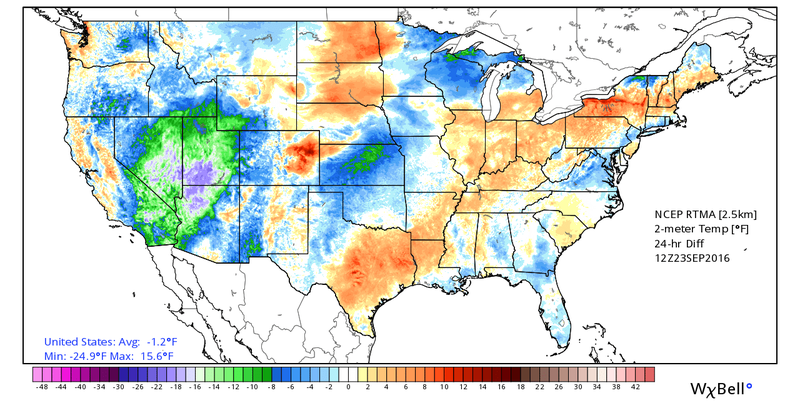 Notice the widespread 30's across the Western U.S. Its fall out west for sure. 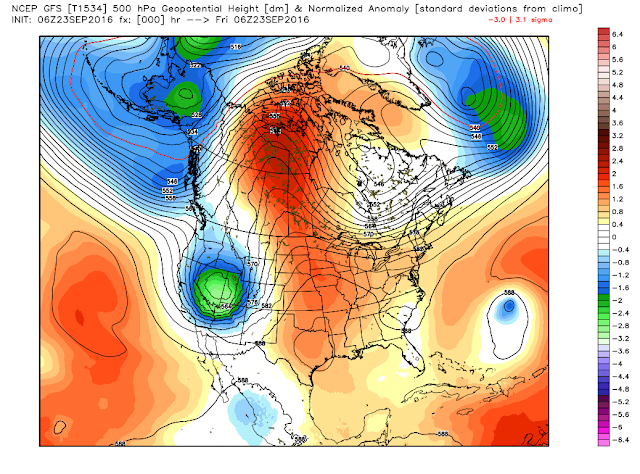 A powerful closed mid-level low was centered over Nevada early this morning. This storm is forecast to wobble southward today into the first of next week. 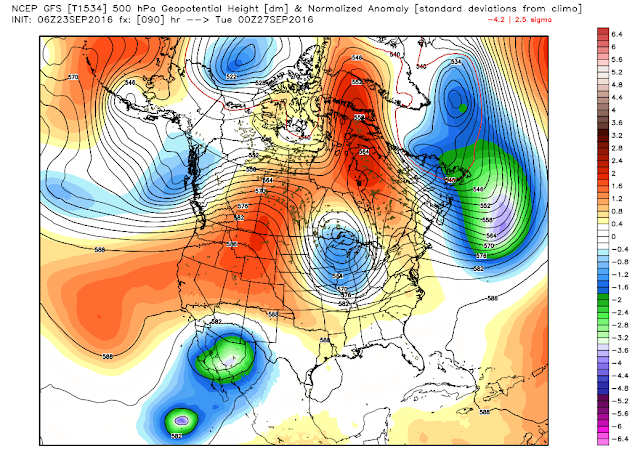 And if the models are correct it will end up in Northwestern Mexico as a cut off low by Monday. The European (ECMWF) model is jumping on this idea of a cutoff low over Northwestern Mexico by Monday morning also. This storm is strong enough and cold enough that snow is forecast over parts of the Western U.S. this weekend. 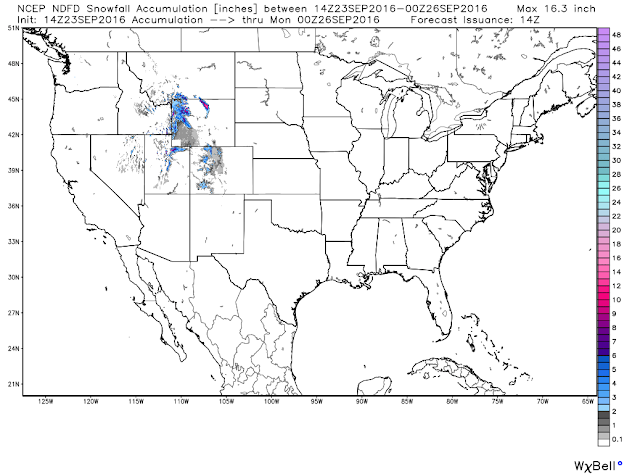 Although snow is not forecast for New Mexico I suspect that some of our very highest peaks (above 11,000') may see some of the white stuff this weekend. Today will be another hot one for much of the local area with afternoon highs in the low 90's. 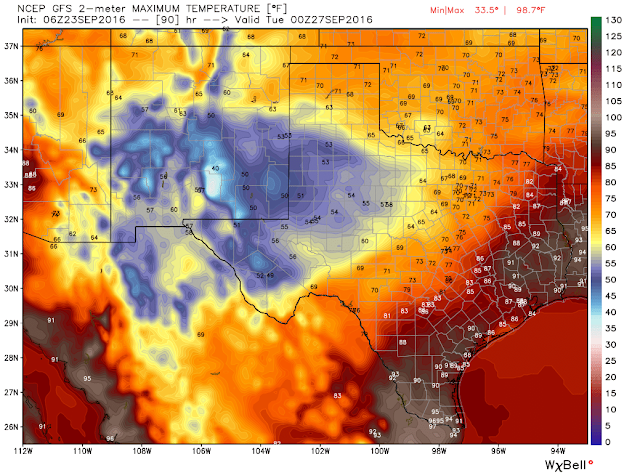 Saturday should be a few degrees cooler with highs in the mid-upper 80's. A strong cold front will sweep across the region Saturday night and Sunday morning dropping our temperatures dramatically compared to what they have been. Most of us will only see high temperatures on Sunday in the 60's and 70's and Monday may not get out of the 50's. Sunday and Monday look to be raw with gusty northerly winds, thunderstorms, and heavy rain with temps only in the 50's and 60's. So it appears that there will definitely be a fall chill in the air. Our high temperatures on Monday will be some 25 to 35 degrees below normal if the GFS model is correct. Of course it will be even cooler in the mountains Saturday and especially on Sunday with their high temps only in the 50's to near 60. As the storm to our west approaches and settles into the Four Corners Region by this evening we will start to see an increase in thunderstorm activity. A line of thunderstorms may develop this afternoon and evening across northeastern and eastern New Mexico. A few thunderstorms will be possible across southeastern New Mexico tonight. The dryline is forecast to set up across the area Saturday afternoon so we will need to watch it closely to see if a few severe thunderstorms form along and ahead of it. We will also need to keep a close eye on the sky Saturday evening into early Sunday morning for the possibility of a few severe thunderstorms forming along the approaching fast moving cold front here in southeastern New Mexico and West Texas. As a much colder airmass settles in behind the cold front Saturday night and Sunday our chances for rain so of which may become heavy and times and scattered thunderstorms will increase. Some of these thunderstorms could possibly be severe and there also will be the threat from localized flash flooding from the heavy rains. 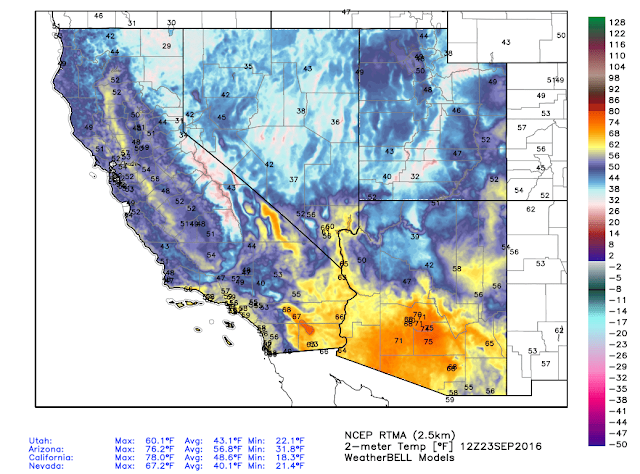 A High Wind event may also develop in the Guadalupe Pass Area with the arrival of the strong cold front Saturday night and Sunday morning. A Freeze Watch has been issued for the San Juan Basin of Northwestern New Mexico for Saturday morning. Farmington and surrounding areas will likely see light freeze.